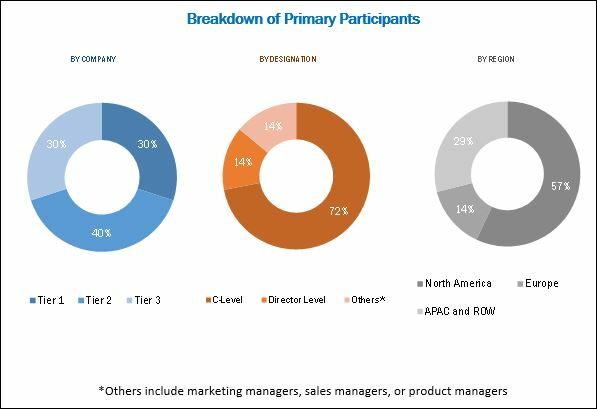 [151 Pages Report] The global hosted PBX market was valued at USD 4.19 Billion in 2017 and is expected to reach USD 9.50 Billion by 2023, at a Compound Annual Growth Rate (CAGR) of 14.9% during the forecast period. The base year considered for this study is 2017, and the forecast period is 2018–2023. The main objective of the report is to define, describe, and forecast the hosted PBX market size by component (solution and services), organization size, vertical, and region. The report provides detailed information on the major factors (drivers, restraints, opportunities, and challenges) influencing the growth of the market. The report attempts to forecast the market size with respect to 5 main regions, namely, North America, Europe, Asia Pacific (APAC), Middle East and Africa (MEA), and Latin America. It strategically profiles key market players and comprehensively analyzes their core competencies. The report also tracks and analyzes competitive developments, such as partnerships, agreements, and collaborations, mergers and acquisitions, and new product developments, in the market. The hosted PBX market consists of vendors providing hosted PBX solution and associated services including virtual deployment and setup, network traffic management, virtual assistance and support, configuration and change management, bandwidth management and optimization, online charging services, emergency call routing services, compliance management services, and protocol management services to commercial clients across the globe. Major vendors, such as Cisco Systems (US), AT&T (US), Avaya (US), BT Group (UK), Mitel Networks (Canada), 8x8 (US), Polycom (US), Comcast Business (US), MegaPath (US), CenturyLink (US), RingCentral (US), and XO Communications (US). The other players include Ozonetel (India), Nexge Technologies (India), BullsEye Telecom (US), TPx Communications (US), Telesystem (US), OneConnect (Canada), InterGlobe Communications (US), 3CX (Turkey), Star2Star Communications (US), Nextiva (US), NovoLink Communications (US), Datavo (US), and Digium (US), have adopted new product launches and partnerships, agreements, and collaborations as key strategies to improve their services and provide better solutions to enterprises and to expand their market reach. 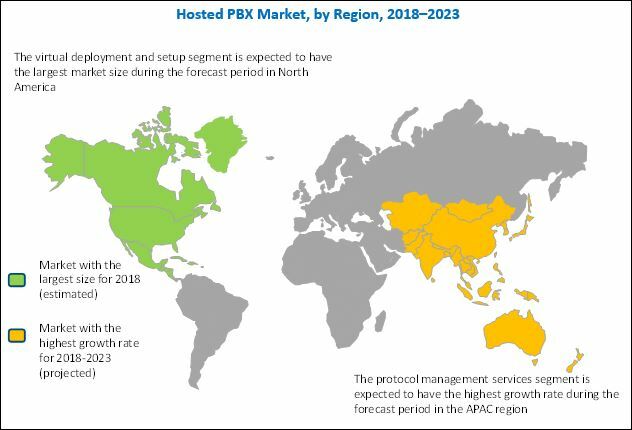 MarketsandMarkets forecasts the global hosted PBX market size to grow from USD 4.73 Billion in 2018 to USD 9.50 Billion by 2023, at a Compound Annual Growth Rate (CAGR) of 14.9% during the forecast period. The hosted PBX market is segmented on the basis of components (solution and services), verticals, organization size, and regions. The market is gaining traction, as hosted PBX is instrumental in offering a reliable and appropriate choice for enterprises that are demanding for a centralized and reliable phone system, without the hassles of onsite setup and maintenance costs. Hosted PBX solutions and associated services actively provide cost-free telephony features, thereby empowering enterprises to save on their CAPEX and OPEX. Hosted PBX removes the burden of the regular maintenance of the existing traditional phone system and frees up the core IT team to focus on their primary processes and business operations. In addition, it empowers enterprises and boosts their corporate image, so that they can focus on building an impression of being a large enterprise with a professional and hassle-free phone system. Services are evolving as an important aspect, as vendors are offering integrated service packages along with IP telephony solutions to their commercial clientele. The services segment of the market comprises various services, such as virtual deployment and setup, virtual assistance and support, network traffic management, bandwidth management and optimization, configuration and change management, online charging services, emergency call routing services, compliance management services, and protocol management services. The virtual deployment and setup segment is expected to hold the largest market size during the forecast period, as this service helps enterprises in deploying and setting up IP telephony by providing virtual support and assistance via the internet. The organization size segment is categorized into SMEs and large enterprises. The vertical segment is further categorized into IT, Banking, Financial Services and Insurance (BFSI), retail, government and public sector, healthcare, manufacturing, education, and others (travel and hospitality, automotive, transportation and logistics, and energy and utilities). Hosted PBX is delivered as a hosted service and empowers enterprises to utilize the total benefits of a phone system, including Unified Communications (UC) applications, such as unified conferencing and messaging, VoIP calling, intelligent call routing, emergency calling, and on-demand applications, such as fax and video. It helps enterprises in saving on installation, operation, and maintenance costs, which are involved in a traditional PBX system, thereby offering reliable and centralized cost-effective telephone systems. Furthermore, hosted PBX provides add-on features that empower enterprises to scale or extend their telephone lines or accounts virtually with the use of softphones, thereby eliminating the need for dedicated hardware or device. North America is expected to hold the largest market share and dominate the hosted PBX market during the forecast period. The region has witnessed huge investments in wireless technologies and the rapid adoption of trending technologies, such as cloud, IoT, mobility, and UC, which drives the critical need for reliable connectivity and communication. Furthermore, the growth in the North American region is attributed to the low TCO and OPEX required for hosted PBX as compared to the traditional PBX or telephony system. These factors are expected to drive the market in North America. The startup culture in North America is growing at a high rate as compared to other regions. Furthermore, growing number of SMEs and increasing digitalization in organizations are projected to drive the North American market. SMEs in North America adopt hosted PBX solutions and services to achieve a reliable communication system to improve the connectivity within organizations with less investments and minimal maintenance. Asia Pacific (APAC) has witnessed an advanced and dynamic adoption of new technologies and has always been a lucrative region. The hosted PBX market in APAC is expected to grow at the highest CAGR during the forecast period. The growth in this region is primarily driven by the strong positive outlook of regional enterprises. In APAC, the demand for UC and video conferencing is growing, and hence, companies are looking for advanced UC components and delivery platforms to achieve centralized and reliable connectivity and communication system. The technological advancements in APAC, along with the increasing trend of adopting VoIP solutions and services, are expected to provide added benefits to the growth of hosted PBX market in APAC. Concerns related to security and privacy is likely to be one of the restraining factors for the growth of hosted PBX market. However, recent developments, new product launches, and acquisitions undertaken by the major market players are expected to boost the market growth. The study measures and evaluates major offerings and key strategies of the major market vendors, including Cisco Systems (US), AT&T (US), Avaya (US), BT Group (UK), Mitel Networks (Canada), 8x8 (US), Polycom (US), Comcast Business (US), MegaPath (US), CenturyLink (US), RingCentral (US), and XO Communications (US). The other players include Ozonetel (India), Nexge Technologies (India), BullsEye Telecom (US), TPx Communications (US), Telesystem (US), OneConnect (Canada), InterGlobe Communications (US), 3CX (Turkey), Star2Star Communications (US), Nextiva (US), NovoLink Communications (US), Datavo (US), and Digium (US). These companies offer reliable hosted PBX solutions and associated services to commercial clients across regions.